The CT100 is designed to make simple and accurate ionic contamination tests for Printed Circuit Boards (PCBs) for cleanliness measurements. 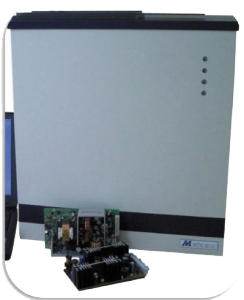 The system is fully in compliance with MIL-P-28809, MIL-STD-2000A, DEF-STD 10/03 IPC-TR-583, IES Standards. The CT1000 is designed to make simple and accurate ionic contamination test on big boards (up to 700x700mm) in fully compliance with MIL-P-28809, MIL-STD-2000A, DEF-STD 10/03 IPC-TR-583, IEC Standard. Ionic extraction or Resistivity of Solvent Extract (ROSE) testing allows process control of aqueous and semi aqueous cleaning for bare and assembled printed circuit boards. The process is in compliance to industry specifications including MIL-STD-2000A, IPC-TM-650 and ANSI/J-STD-001. The process of cleanliness testing can be used to minimise corrosion or product performance problems associated with ionic contamination and process control of no clean processes.